The NHRA Chassis Certification will take place on Saturday, March 8th, from 9 am – 3 pm, in the Expo Idaho general parking lot (south). Please call the Firebird offices at 208 938-8986 or drop us an email if you’d like us to add your name to the chassis sign-up list. Also – you can save your postage and get pre-registered for the 43rd Annual NAPA Ignitor-Lucas Oil Drag Race Series at the Firebird booth inside Expo Idaho. We will also have Gold Cup registrations and permanent number cards available (for new numbers or renewals). We’ll be easy to find, our booth is right near the stage where all the trophies are displayed. Furthermore, we will also offer an E.T.I. (annual tech inspection) to racers who maintain a current NHRA. 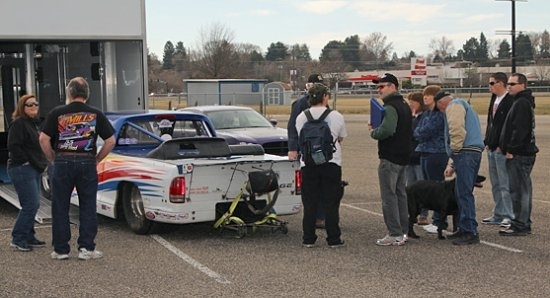 If you’d like to have your car, your bike, your truck, your Junior Dragster teched for the season, please let us know, so we can add your name to the growing list. Saying goodbye to someone is never easy. For all of us in the New family, we are sad to report the passing of the patriarch of the New family, Billy Joe New. Born in Bisbee, Arizona on August 16, 1934, Bill passed away at home from natural causes on February 11, 2014, with his entire family by his side. His life was always filled with family and friends, which included Ellanor, his wife of 53 years. He touched many people’s lives. Operating a family business for nearly half a century, he was keenly involved and respected in the development, expansion and growth of Firebird Raceway and producer of the Boise Roadster Show. Originally making his first trip to Idaho in 1948 with $10 in his pocket and a Greyhound bus ticket, he journeyed north to visit his grandmother. Upon a future return with his mom, they both quickly grew to love everything the state had to offer. He had a real knack for fishing, quite often taking trips to fly fish for trout up the middle fork of the Boise River. Hot rodding was in his blood at a very young age. At the age of 17, his first car was a `41 Ford sedan. When he turned 19, he put together a chopped `32 Ford three-window coupe with plenty of power, a modified `59 AB flathead that could run with best. And it didn’t take long for him and a number of friends to establish the Bootleggers car club, one of the valley’s original hot rod clubs, spending many evenings cruising and hanging out at Murray’s Drive In. He was so proud of the fact he participated at one of the earliest NHRA Safety Safari meets, which was staged at an air base outside Pocatello back in 1954. During this time frame, he worked in the original construction and formation of Lucky Peak Dam. Not long after, he became a lineman for Mountain Bell, along with a job as a part-time mechanic and pumping gas at a Shell service station at 11th and Front in downtown Boise. Motivated to run even faster, his Deuce coupe was followed by a genie `40 Ford coupe purchased from a farmer in Emmett. He modified and added a hemi powerplant before venturing off to southern California in pursuit of more Drag Racing. This provided him an opportunity to go racing at such prominent tracks like Pomona, Paradise Mesa, Santa Ana, San Gabriel and other stops. He worked selling ice cream from a Carnation truck at events like the Rose parade. He also landed a job with Electro Data in Pasadena, a company that specialized in some of the earliest of main frame computers and assisting companies with payroll systems. By 1956, he was drafted into the U.S. Army. He had basic training at Fort Ord in northern California before being sent for additional instruction to Fort Gordon in Georgia. He was later stationed in Zweibrucken, Germany, qualified as an elite sharp shooter, drill sergeant and specifically assigned to work within the Military Police. Upon honorable discharge and returning home, he took up residency in southern California, going to work for Bowler & Chivens. He worked in the field of satellite tracking cameras. Not long after he took a position as a loan officer and appraiser for Glendale Savings and Loan. It was at this time that he met an American Airline stewardess named Ellanor. They married on June 18, 1960. W. Scott was their first child, arriving in 1961. It was during this time period that he was approached on a trip back to Boise to visit his mom that he consider going to work for an Idaho company headed up by Arthur Oppenheimer. The year was 1962 when he, his wife and new baby picked up stakes and departed for the Gem state. He took on a roll as a national sales manger for Oppenheimer, selling potatoes by the rail road car full. Their second son, John, arrived in 1963. He continued working for several years selling both french fries and an abbreviated adventure into the onion ring business. In 1967, their third son, Brad J. made family life even a little more interesting. An idea spawned in 1968 to make a concerted effort was thrust forward to bring organized drag racing to the greater Treasure Valley. The location was selected in the northwest foothills off Highway 16. And from it came the start of a dragstrip named Firebird Raceway. Prior to this, the only controlled racing in the region took place on either Gowen Field road or a one-time unified event on Glenwood Blvd. in the mid-60’s. Furthermore, he started one of the region’s biggest motorsport’s events known as the Boise Roadster Show. Spanning 42 years, the Roadster Show takes place at Expo Idaho every March and is a nationally-recognized event aligned with the International Show Car Association. Looking back in time, he was a real pioneer of all things under the umbrella of motorsports. He was inspired to create a real family environment for virtually fans of all ages to enjoy. Equally, he was dedicated to providing a safe and welcoming facility for racers from all over the country to compete each season. His family includes his wife Ellanor of 53 years, sons Scott (Debbie), John (Anna), Brad, and three grandchildren, Connor, Colin and Austyn. 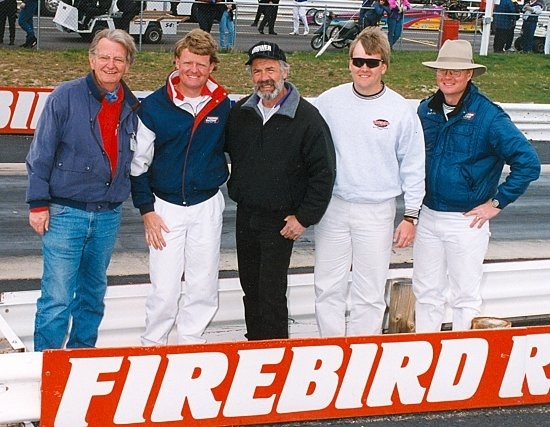 Moreover, the New Crew as they have been recognized for many decades includes all the staff and crew of the raceway, too, many of which have been like an extension to the New family. He was preceded in death by his parents Ernest and Lucille. We are all confident that when he arrives at the Pearly Gates, Ole St. Peter will give him an automatic green light to Heaven. God speed.